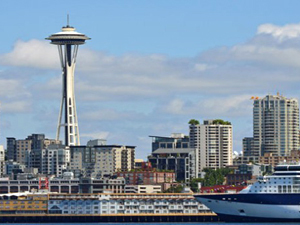 Last Minute Cruises From Seattle - Which Cruise Line To Choose? Last Minute Cruises From Seattle – Which Cruise Line To Choose? Last minute cruises from Seattle are filled with the beauty and grandeur of the state of Alaska. Long been known as ‘The Last Frontier’, cruises to this wondrous place excite the senses and offer a much different cruise experience than those to tropical climes. Cheap cruises from Seattle are offered as soon as the Alaska schedule begins, and with all the different cruise lines that service the port. Last minute cruises from Seattle include the Holland America sailing on Oosterdam, a 7 night trip that departs on May 5th and includes cruising Puget Sound and visits to Tracy Arm Fjord, Juneau, Ketchikan, Sitka and Victoria. This cruise is now offered at 63% off the list price, with fares as low as $599 per person. Holland America is celebrating their 140th year this year and are no slouches when it comes to luxury cruising. Their spacious accommodations, five star dining options, opulently decorated ships and onboard enrichment programs make their mid-size ships appealing for that vacation to remember. If you love attention to detail and a more upmarket experience, then Holland America is for you. Alaska cruise deals continue with the Carnival 7-night option aboard the Miracle, with fares that now start at $509 per person, a savings of 75% if you book that last minute trip soon. This round trip deal includes sailing to the Tracy Arm Fjord, and stops in Skagway, Juneau, Ketchikan and Victoria. Last minute cruises from Seattle are also available with Princess aboard the Star Princess, a lovely ship with lovely amenities that will take you to Juneau, Skagway, Glacier Bay National Park, Ketchikan and Victoria all for just $552 per person on their May 11th sailing. Another line offering cruises from Seattle is Lindblad Expeditions, who have teamed up with National Geographic to combine expedition style cruising with educational experiences. Their 11-night cruises take you to lesser known areas of Alaska where you partake in shore excursions and explorations in groups or by yourselves to really become immersed in the natural wonders of the state. Last minute cruises from Seattle from Lindblad are all-inclusive and start at just over $8000 per person, not the cheapest cruise out there, but one that is a must for those more serious about the environment and getting up close and personal with the terrain. Like with all ports, cruise deals from Seattle can be had for trips throughout the season, but with Alaska cruises being seasonal, the best time to book is now as they are just about to get underway, and this is where the best deals can be had as ships try to fill up before they depart.